I went to the evaluations office yesterday to pick up my baccaulaureate degree application. They asked me if I was going to be finishing up the graduation requirements this semester. I paused. Let it sink in. Let myself process. “Yes,” I answered finally. She handed me the application. For a mere $35 I can apply to graduate! Yessss!!! This is so funny to me because 1) you pay to get in, 2) you pay an arm and a leg, and perhaps your firstborn so you can complete your degree requirements, and then 3) you have to pay to leave. Yes, yes… it’s the way the world works. Economics blah blah. I’ll be glad to be out of school with my BSN. Sorry if I sound a little bitter. It’s just my school… I go to a public uni. So with the recession and the subsequent decrease in tax revenue, decreased school budget, increased school fees… I’ve basically been paying more and getting less for it. We all have. Anyway, this was supposed to be a happy post! Ignore all that whining and complaining in the previous 3 paragraphs. Let’s party! After I turn that sucker in all I have to do is survive this semester, pay a few more fees (haha), and I’m outtie! Woot! What do you think? What’s going on at your school? So… remember when I was complaining about what a dummy I was for not scheduling myself a break on Mondays? I really, really, really should have just kept that one to myself instead of releasing it into the universe, because NOW I actually do get to have a break. A THREE HOUR BREAK. You read correctly: 3 hours. Apparently some 5th semester students (remember we have 6 semesters) are graduating this summer… so it would be advantageous for them to take the NCLEX prep course. They want in. Unfortunately it’s not offered in the summer. And now us “regular” folk who don’t like to take summer courses have to accomodate the overachievers. Instead of 11:00 to 1:00, the course has been bumped up to 8:00 to 10:00. The room we previously had was not big enough to hold everyone. The room we would fit in is available at the earlier time. So there. 8:00 to 10:00 NCLEX review. My next class is at 1:00. My last class is till 5:15. Posted by futurenightnurse in Free Time, General. I think I’m getting the hang of this thing. WordPress is definitely different from another site I’m used to. For one, there is no edit button in the comment section… it drives me nuts to see myself having made a typo or simple error, and even more nuts that I can’t fix it. Another thing is the reply button… I keep forgetting that the responses nest and sometimes I’m replying to the wrong person. I may just go back to using the @ symbol from now on. Anyhoo… classes have started and I really shouldn’t be online right now. I should be reading till my eyes bleed. I’ll try to post when I can, because seriously I have a couple of drafts saved that I just need to edit. (Yay for an edit button there!) I’ll come back when I have some time. .. and my nursing classes don’t even start till Monday. Anyway, I have some work to get done. I want to get ahead… because I have a feeling if I DON’T stay above water, I’m going to D-R-O-W-N this semester. Posted by futurenightnurse in General, Just One Thing. I love the portability of plastic water bottles. I usually buy a case of 24. Then each morning before I head to class I grab a bottle or two and go. This beauty here was only a few bucks at Target. 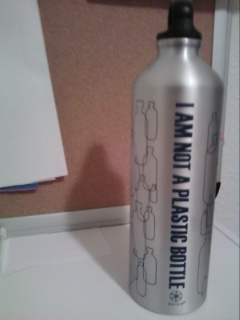 It’s an aluminum water bottle by Gaiam. It’s cute (I love the writing on the side), portable, cold water seems to stay cold longer in this bottle, AND the best part: there is less waste! Yesss… I can refill it as many times as I want! The only downside is that I have to wash it instead of just tossing it… but that’s ok. I think I’ll survive. Do you do any of the 3 Rs (reduce, reuse, recycle)?